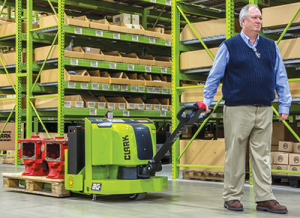 Clark’s walkie pallet truck features an enclosed AC motor making it suitable for wet environments and food processing plants. It comes with a small yet powerful 24 Volt battery and a 100% AC system. The minimal steering effort design comes from the low mounted steer handle that increases leverage. Rollers and tapered slides for improved pallet entry, exit and overall pallet handling.